DO YOU DREAM OF A CAREER IN INNOVATION AND DESIGN? ...Or would you like to kickstart your own tech company? 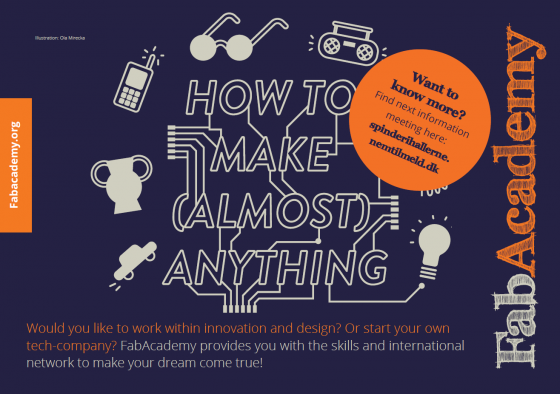 FabAcademy provides you with the skills to follow your dreams of a maker-career and applications are now open! Join us on 4 September in FabLab Spinderihallerne, when a former FabAcademist will share the experience and talk about how FabAcademy can help kickstart a career within innovation, technology and design. You will also get a chance to see and be inspired by some of the prototypes created throughout the course. THE QUESTION IS: IF YOU COULD MAKE (ALMOST) ANYTHING, WHAT WOULD YOU MAKE? During this intense 20 week course you become part of an international network and achieve the tech skills necessary to pursue your dream and create your product. During the course you will attend a live masterclass led by Neil Gershenfeld (also prof. at MIT), director of the FabAcademy Program. The masterclass takes place once a week at 3pm by videoconference in FabLab Spinderihallerne, Vejle. Every week you will be working hands-on solving an assignment on a new technology, eg. CAD, Project Management, Electronics, Programming, 3D-printing, Laser cutting, CNC and Interface design. After finishing the programme you will travel to Egypt to receive your diploma and mingle with fellow makers at the Fab15 conference in summer 2019.